I do have my regular daily hand and nail care routine - see it HERE, but lately I also have been testing cuticle balms during the day time, and in front of the TV in the evenings. Lately I have for the second time in my life tested the popular Burt's Bees Lemon Butter Cuticle Cream, and I love the Burt's Bees hand creams - BUT the cuticle cream does not really work for me. Actually the cuticle on my swatch hands index was a bit sore, not yet red, but I was afraid of a possible inflammation in progress. After using Soft Paws twice it was however gone. I take good care of my hands and cuticles in general, so I notice any changes. I imagine that really dry cuticles will LOVE Soft Paws, mine certainly do, even if they are in a good condition. Vitamin E, Calcium, Almond Oil, Sassflower Oil, Rice Bran Oil, Sesame Oil, Jojoba oil. You can buy it in the very handy twist up pen that has a really nice brush and a regular nail polish bottle with a normal lid with brush. It works like a charm and depending on how many times you twist it, it dispenses more or less oil, so it's easy to choose. If your cuticles are super dry, they probably need flooding (keep your hands at rest and let it soak in) and then maybe the bottle would work best. I really like how the oil is quickly absorbed, and it has a very subtle, natural and pleasant scent. If you are interested in Soft Paws, you can buy it from Purrfect Pawlish. And have a look at the gorgeous new collection of nail polishes, the Summer Date trio, released today!! 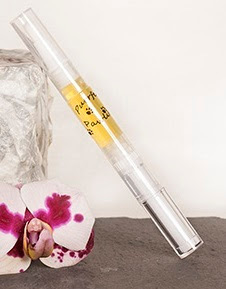 That's the nice thing about this oil, it isn't greasy because it dispenses it so just right! Looks like it's easy to use. I must admit my hand care routine isn't big! But it is basically cream or lotion on at night before bed. If my cuticles are dry then I use a cheap oil and it seems to do the trick! its looks easy to use=) i try to oil my nails before bed! Sounds like a great product. I love cuticle oils in pe as delivery method. It is cleaner and I find it easier to use. It's my first try, but I definitely agree, and it's not greasy! I also prefer natural ingredients, and product is really great! Sounds great, I have a pen from another brand, Bliss Kiss and it works exactly like this one, and I love it, so easy to use. It's my first pen, and I love it! It is my first, and yes, it is super convenient! This packaging looks great for daytime use, easy to put in the handbag or something! Looks interesting, I might give it a try. It really is super easy to use! I love cuticle oils... (I use to "flood" my cuticles, when I'm sitting in front of my computer), this one seems so good!